I bought my first Koi here in 1989 and have made hundreds of return visits to buy more Koi since then. This farm is an experience indeed and the biggest volume producer of Nishikigoi in Niigata by far. There are Koi here for sale in a very wide range of qualities from very cheap right through to very expensive – although these are not directly on view to the passer-by. The range of varieties on offer is also superb although I have only ever seen one Showa. This outlet is also known as Hirasawa or Seitaro, the photograph is of the Utogi location although he has other Koi in Araya village and many at his home. 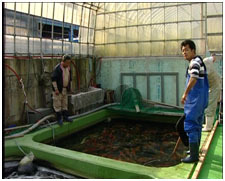 It is said that he has over 500 mud ponds for his summer stocks.